For almost any other type of hobbies or modeling that we do, most of us started with some kind of kit, written instructions etc. For ships in bottles, there are some instructions, but very few kits available for the new modeler. The new modeler must become a scratch builder from the start. I wonder if some beginners might be nervous to start this hobby, with limited abilities and knowledge, when they compare themselves to a modeler who is seasoned. 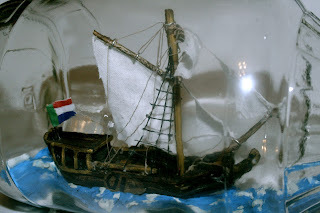 In an effort to help the beginner on their journey to successfully creating their first ship in a bottle, I would ask those who have some experience to chime in, and hopefully answer a few questions. 1. What ship or style and level of complexity would you choose for your first SIB? 3. What would be the best choice of bottles and size of bottle for your first build? 4. Would you put sails on it, or leave it bare? 5. Are there other things that you wished you had known, or done different for your first SIB? 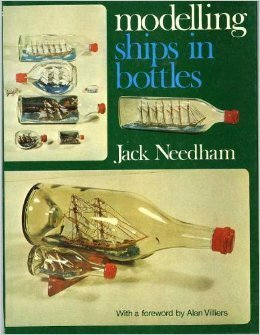 I very highly recommend "Modelling Ships in Bottles" by Jack Needham, either edition. I have not seen a better "how to" book on the craft. Jack will take you through several builds from a simple two masted schooner through to a three masted square rigged ship. Then hang around here and ask questions while waiting for it to arrive and afterward as well. for #2 and #3 build as large as you can find a bottle for with a large diameter neck - both will make the build easier. Be most concerned about clarity and minimal distortion closely followed by the neck diameter. A bottle that has a usable internal space that is about as tall as it is wide work well for most two and three masted vessels. #4 absolutely, put sails on it. They can hide a lot of minor errors. #5 I wouldn't change a thing, I had Jack helping me. I only wish I had a place like this to learn from 35 years ago. I am one of those beginners. 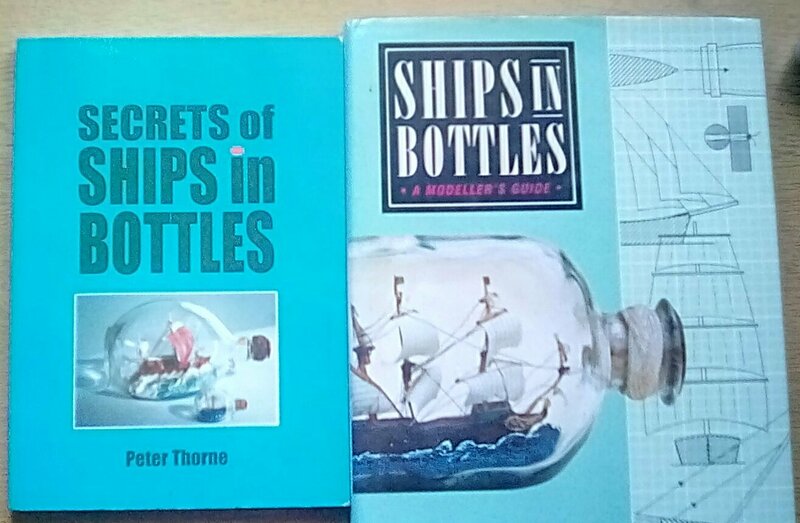 I have completed three ships and started with "Build a Ship in a Bottle" by Capt. Dan Berg. This was a very good start for me. I then proceeded to build my library by first checking out books on building ships through the local library and if I found one that I liked I purchased it. This way you don't spend money on a book that doesn't fit you. I have also owned several sail boats and built two from plans over the course of my working life. Due to having five fused vertibre in my back and age, my sailing days have come to an end. I really enjoy the hobby and find it to be very rewarding for me. However, I have a tendancy to want things perfect before I start a project and find I sometimes thinks things to death instead of just "doing it". My last project was the CSS Albermale, which I have completed but not bottlesd yet. For me, the books, this forum, and a few of the other forums have helpled me tremendously. I don't post very much as I am in no way as knowledgeble as others on this forum. Well thats my two cents worth hope it helps a little. If I had to do it over again I'm not sure I would change much. I am very lucky to have started in an age where information is plentiful. I had quiet a few ships done before I picked up a book. Almost every thing I've learned has been from websites and forums. 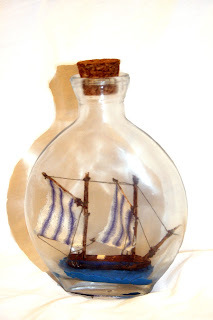 It was surprising to me at first how freely the ship in bottle community gives their secrets away. As I learned more and discovered how few we are it made sense. Any way as far as the questions. 1. I think first sibs should be simple but enjoyable too. If it were me I'd start with one any one mast ship. Though if you have little interest in the ship your doing it's less likely you'll persist when things get tough. Their is a sense of accomplishment doing two or three masts and if you so dare go for it. I remember George Fulfit in the movie Steady as She Goes talking about how exciting it is to get those first few ships done. He recommended starting with a two mast brigantine. Then he said, "Then you get excited. I'm going to do a three master...no wait better slow down and do another two master." He had such enthusiasm and charm it was fun to watch and he's absolutely right. That's how it feels. No matter what the ship. You get one done and you feel so accomplished and excited you got to do it again. 2. I think size is a personal preference too. I get intimidated by larger models for some reason. I started out building 4 to five inch models. I think that's as good a size as any. 3. Starting out I think the most important thing to have in a bottle is a wide bottle opening. Condiment bottles are good for this especially teriyaki. It is a different feel seeing the model and not being able to just reach out and touch it. A wide opening can help adjust for that since it allows more movement with the tools. 4. I think smaller ships should have sails. Looking at various models on line I think the ones that look good with no sails have a lot of masts and a lot of spars. There is a lot of beauty in good rigging. It's an art in and of it's self. Starting out though I think either or. I don't think adding sails is difficult. Paper sails was a bit of a learning curve for me in figuring out how to get them in with out crinkling the paper. I suggest starting with cloth sails just because they are easier. 5. I wish I had known rigging in general with my first sib but that's a long story. Figuring out hull shape was a big turning point for me. My first ten to fifteen ships were planks of wood with sticks and cloth. They sort of resembled ships but not very much. Once I discovered how to add tumble home and other various parts that make up the hull my ships started looking much better. My Stratenjaucht is was probably the first one that I started figuring out how to carve hulls. Every thing else just sort of builds on each other. I saw other modelers doing fantastic work I barraged them with questions and they told me how to do it so I tried things out. Some times it worked, sometimes it ended badly. I used to have a list of who I thought was the best at each part of the ship and I studied every ones work closely to figure out how they made it look that way. I've come a long way but I think I still have a lot to learn. Learning new techniques and getting them to work is probably the funnest part of ship bottling. 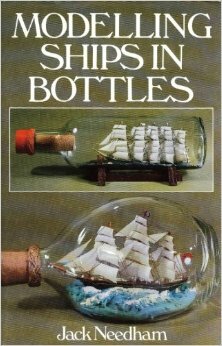 If you can find the book 'How to Build Historical Bottled Ships' by Bill Lucas snag it immediately! My first one was loaned and never returned. I was fortunate to get a second one through: Historical Bottled Ships, 2820 Summerset Circle, Suamico WI 54173. I have always wanted to learn this craft and this was my first book purchase on the subject. I immediately built the barque 'Elissa' using methods from Mr. Lucas' book. It was my very first project! It was a split hull design with 120 control strings from the board. I can't imagine 120 control stings. I have a hard enough tome with twenty to thirty. I'll have to look into that book. My first SIB was the Amati Hannah kit which I completed last year. I've been working on my larger non-SIB models since while reading a number of the SIB books out there. I probably have most of them, which I generally got used for good prices on sites like Abebooks.com. 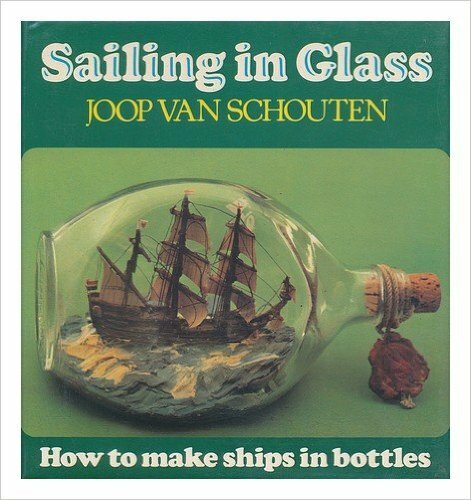 Along with Dave's recommendation, I would add "Sailing in Glass" by Joop van Schouten. It's very well done with great tips and nice models with step by step directions. This and the Needham book I think are very good for the beginning and intermediate builders. 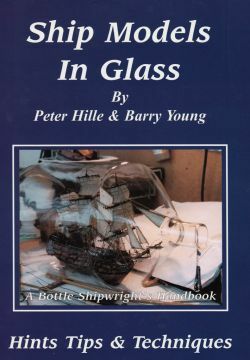 If you really want to learn all the tricks in the trade from the masters out there, "Ship Models in Glass" by Hille and Young in my opinion is the must-have book. In fact, I would say that if you only could buy one SIB book, this is the book in the hobby to buy. The authors specifically note that the book is a compendium of tips and tricks of the trade from all over the world (see the long bibliography), which pretty much every topic covered. It's really an amazing book in my opinion. For my first scratch SIB builds, I am going to start with some of the basic builds in the van Schouten book, modified with some of the more advanced techniques found in the Hille and Young book. Thanks, Landlubber Mike! I purchased one of these from the supplier in the UK. Can't wait to get it! Landlubber Mike- I got my book, 'Ship Models In Glass'! I'm glad I bought it. Not that I'm an expert or anything but it has some great ideas and techniques listed. You can never have too many books! I have the Needham books, too. There is a book by Ronald Roush, 'Bottling Ships and Houses' from 1975 by Tab Books, Blue Ridge, Summit, PA 17214 that I have. It is along the same lines as the Needham book. The Lucas book is the only one that shows the technique of placing the hull in the bottle first then dragging the masts and etc. afterward. That technique allows for a slightly larger model inside the bottle for you are not restricted as much by the bottle neck size so much. Mr. Lucas goes into great detail so a 'first timer' won't have any problems so long as there is plenty of patience available! Oh... I forgot to mention one more book that I have. It is 'Ships In Bottles' by F.R Berchem. I have the first edition publish in 1990 by Sheridan House Inc., Dobbs Ferry, NY 10522. ISBN 0 911378 99 5 It is a delightful book that goes through all the details of building the model that eases through the bottle neck, folded. I'm also a newbie to this form of modelling and things look abit different from what I've done before , in the way of plastic model ship kits ie: 1/96 scale but , I think I can do it just need a bit of help to get going and make that first step . I don't want start something too ambitious then give up on it half way thro it's build. I want to build something that I can be proud of. I'm glad that I had available a fairly good kit to build from and thought it was a great start. But I also had a SIB that was probably built by an old hand to also inspire me. I have the Needham book that I am revisiting and I also had Peter Thorne's "Secrets of Ship's in Bottles". I find that I use a combination of techniques and I wouldn't take everything Needham says as gospel. I would definitely suggest to start simple if one hasn't built one before. I wouldn't get too hung up on accuracy at first since there is some necessary compromise to get a ship in a bottle and the scale is very small (below 1/ 4" equals one foot scale accuracy is tough to achieve and SIBs are much small than that). My biggest challenge is finding an appropriate bottle. Unless you have access to a bar which will allow you to take their empties, finding a good bottle can be a struggle. I would recommend a beginner get one of the Woodkrafter kits that seem to still be available on the global garage sale. A schooner or sloop is a good choice for build number one. Finding good ship plans is almost a must for scratch builds but then you have to figure out how to fit it to your bottle. It is a shame that high quality kits are not available. I was even thinking about exploring the idea with a manufacturer. We have two pubs within a mile and a half from where I live so with a bit of luck I may come a cross a few of suitable bottles which I could use. What would you suggest I use to give me a idea of the inside height of the bottle and the type of wood I could use , someone suggested I use beech is that correct? Hi Niallmhor, I live in the US so the materials I have available may be different from where you are. It depends on how much you are going to work the wood but a closed grain somewhat hardwood is preferable although I made my very first scratch models from scrap pine. Basswood is a modelling favorite, beech is probably a good choice since it's commonly used to make dowels and spools. The old time books recommend mahogany but good luck trying to find it. Just about the only wood I would not try to use is balsa since it is way too soft to take to being rigged. You can use a piece of paper on the end of a dowel as a gauge for inside diameter. Or draw on paper a silhouette of the actual size of your model and glue it to the end of a dowel and roll it up and stick inside your bottle to size up fit. Bottles that are tall but not overly long as a good choice. The square Johnny Walker bottles were common to be used. The Pinch scotch bottles go for a good dollar, empty that is. Jack Daniels bottles are also good. Oval bottles work well. Thank you all for your encouragement, it's going to help me no end on my first project. Nothing fancy , just a simple one masted ship to start with and see how it turns out. I managed to get my hands on the following books ( see photo ) . The one called "Secrets to Ships in Bottles" may help me pick something simple to go for and what you gentlemen have suggested I'm looking forward to my first attempt at a SIB! many thanks once again for encouragement gentlemen.